When you’ve had a long and stressful day, what better way to unwind than to pamper yourself in your luxury bathroom? Getting the bathroom of your choice isn’t always an easy one, but we will provide assistance and guidance in choosing the new shower rooms or wet room for you. With a range of bathroom design and tiling options, we have exactly what you need for the perfect new bathroom of your dreams and we don't stop there! We have an experienced and knowledgeable team of wet room and shower installers that will provide a professional installation to give you that perfect bathroom you need. We ensure we provide all of the necessary central heating installation services that you would need to keep your property warm and then provide the shower rooms you need to keep yourself clean. We provide everything you need from a new shower to a range of new bathroom installations so you are certain to find exactly what you want. Call our specialists today on 0800 389 1759 to go through your own requirements for your shower installation and we will arrange a free survey and no obligation quotation. Employing a specialist team of new bathroom and shower installers; we ensure that you receive nothing but the highest quality services that will create the new shower rooms, bathrooms or wet rooms of your dreams. Nothing is too much for our team and they create a spectacular finish for all projects they complete. Need central heating installation services? Look no further as our team of professional central heating fitters and bathroom suite installers will provide nothing but the best. Dealing with electricians, plumbers, decorators and the bathroom fitters takes time and some of the fun out of your new bathroom. At Flint & Son we do it all for you at an agreed competitive price. 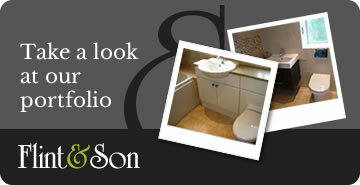 Flint & Son specialises in providing a complete, turnkey installation service to transform your new bathroom. We regularly supply and install bathroom interiors to a diverse range of customers throughout London, Kent and the South East, with many satisfied customers in Bromley, Orpington, Chislehurst, Petts Wood, Biggin Hill, Sidcup, Eltham, Bexleyheath. 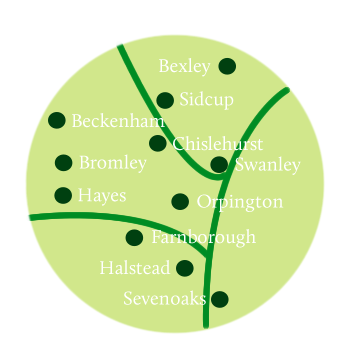 Sevenoaks and Otford. Whatever your needs please contact us to arrange a convenient home consultation time, so that we can show you our portfolio and discuss your ideal bathroom. There is no obligation at all, we just welcome the chance to show you why we think our services and products are amongst the best in the business. Thanks again for your hard work on my new wet room; just had my first shower in three years without cracking my elbow off the shower door! We also supply and install a vast range of products from all well known manufacturers including fitted and free-standing bathroom and shower room furniture by leading manufacturers. We can do as little or as much as you want us to do. We even provide a fitting service only if you prefer to source the bathroom yourself.